Serve with roast potatoes, Yorkshire pudding, gravy & horseradish sauce. Weigh the beef & calculate the cooking time according to the timetable below. Heat the oven to 220°C/ 425°F / gas Mark 7. Season the beef with a little mustard, salt & plenty of pepper, then place in a roasting pan. Do not season the meat in the pan as this could result in over-seasoned gravy. Roast for 20 mins to brown the surface of the meat. Turn the oven temperature down to 170°C / 325°F / gas Mark 3 & roast for the calculated cooking time. 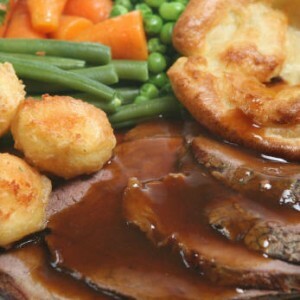 Allow the roast to stand at room temperature for 20 mins, then carve. The beef may be served simply with ‘God’s gravy’, the juices that run from the meat before & during carving. Cooking time: 1 hr in a hot oven, or 1½ hrsin a moderate one. Wash & peel the potatoes &, if they are large, cut them into 5cm pieces. Bring them to the boil in salted water. Simmer for 5 mins. Drain well, return to the pan & shake the potatoes to roughen their surfaces. Melt the dripping, oil or goose fat in a roasting pan & when hot add the potatoes, turning them so that they are coated all over. Season with salt & pepper. Roast, basting occasionally & turning the potatoes over halfway through cooking. Sift the flour & salt into a bowl. Make a well in the centre & pour the eggs into it. Beat the eggs with a wooden spoon, gradually drawing in more flour to the centre. Beat in the milk little by little until the batter is smooth. Leave for 30 mins before use. Put the dripping or oil in a roasting pan, flameproof dish or Yorkshire pudding tin & heat until very hot. Pour in the batter. Bake a large pudding in the oven for 40 mins, or until it is risen & golden. Individual Yorkshire puddings take about 15 mins.